Have I ever mentioned that I don’t particularly enjoy doing laundry (um, yes, here and here and I am sure other places as often as I can toss that in)? I know I am supposed to be working on finding the joy in doing my laundry and being appreciative that I have clothes to wash, but I get some sort of strange satisfaction out of having this light-hearted, and yet strong, dislike of the laundry. I used to be able to do all of the laundry in one day. When we were first married, Friday was laundry day for me. After Kaitlyn was born, I moved that to Monday. It has since grown into a two day event and has encroached itself on my Tuesday as well. And you know how things are just harder when you are pregnant? If you think I dislike laundry when I am not pregnant, you should talk to me about it when I am pregnant. Bending over is about the most monumental task you can give me right now. I have some good little helpers, though, and they love to help with the laundry, so they do lots of bending on my behalf. Back to the laundry growing. I am hoping it is just because I am pregnant and not as efficient when I am pregnant, but laundry is starting to creep into Wednesday. Wednesday! Three days of laundry! Why, I wonder. I thought about this and realized something. These people living in my house (also known as children) are just getting bigger. They get bigger every day, and as they get bigger, their clothes get bigger, which means the loads of laundry get bigger! And we are about to add another person to this mix–a whole other closet full of clothes to wash! And then she will just get bigger. Don’t you just love (and by love I mean hate) when that happens? There you are reveling in your own self-pity–even if it is with a healthy dose of amusement–and the Lord leads you to something like this to, well, put you in your place? So I need to learn to like the work of laundry. And I really should–because these kids are only getting bigger! This work of laundry is only getting more monumental (and yes, you had better believe that as soon as they are old enough they will be in charge of their own laundry). I don’t know why it is so hard for me to learn to like laundry. In general, I really enjoy work. I am a hard worker and get great satisfaction out of cleaning. The laundry thing is just my personal battle. Maybe it is because I can’t just do it and get it over with? I have to sort it, then wait while the machine washes it (and yes, I am grateful I have a machine to wash my laundry), then wait for it to dry, then fold it, then put it away, and there is always this large chunk of time that it is taking up space in my “to-do” list of my brain. I am sure we all have our own personal battles. Whatever yours may be, you might want to join me in learning to like that work. I know it isn’t an easy battle, but I do believe it can be done. I just need to figure out how to like this never-ending task of laundry. Next Post Can it be too hot to sleep? Yes, your kids are getting bigger and thus so does the laundry; but a positive aspect to dwell on is that as they continue to get bigger you are one step closer to them being able to take on that chore themselves. Maybe 12 or 13? Not sure on the best age, but soon it will dwindle down to just you and the hubby's clothes again! I am reading a book right now called Mother Letters. It is a really neat compilation of letters written by moms, for moms. One of them said that for each piece of laundry that she folds, she prays for the person who that item belongs to, or thinks of something she's grateful for about him/her. That might not make you LIKE laundry, but I am going to try it and I think it'll help me feel like the chore has a greater purpose. If kids are helping, that could also be a way of helping them learn to pray for each other and be grateful for their family members. Have you ever heard of or read Large Family Logistics??? I assume you are already a pretty well organized person, but adding a kiddo presents new challenges, as you know. This book has been life changing for me–and I only have 2 kids! She has great tips for organizing the days, training kids, keeping attitudes in check, etc. And it opens with a good overview of Proverbs 31. I LOVE this book!!! (By "I like it… I hate it" I mean that I like doing laundry because it's better than some other tasks. I hate doing it every single day, but I do it that way because it's so much less overwhelming that way. Plus, there is just not time to fold more than 2-3 loads in one day!) My MIL does laundry on Mondays and Thursdays. I like to listen to music while I fold all the clothes, it makes it so much less boring and mundane. This is good. Laundry is not my hated chore, but I can apply this to it 🙂 And I want to know how you get away with only doing laundry on two days! I only have 2 kids and do at least 2 loads a day (mostly my husband's clothes– he changes outfits at least 3 times a day). Wow!! Haha 🙂 I like all the other tips from everyone else, too! Thanks. My friend with six kids has to do laundry every day. 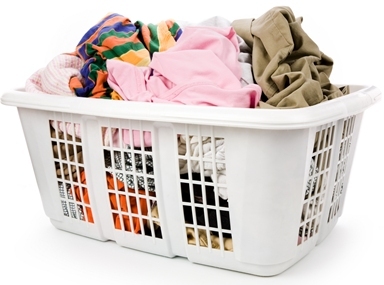 I don't hate laundry but if I had to do it every day of the weeki, I might! Great advice and quote. kmspillman,I was thinking about that. I looked a list I reference for ages when kids should be able to do certain chores and the list has 10 for doing laundry alone completely! That is so soon! Unknown, I will look into that! I haven't heard of it. I am organized, but I think it is always good to hear how others do it because they might have some good ideas that make your life even smoother. lol Katie. I am indeed glad I have an automatic washing machine. And dishwasher too. Jennifer I don't know! I enjoy those things though. Isn't it funny how we all have our things we like and things we don't? Fun idea Mollyanne! Thanks for sharing that.